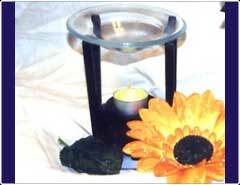 Enjoy our wonderful aromatherapy oil burners made from a thick wrought iron steal material that is strong and sturdy. Our simple but yet elegant aromatherapy diffuser lamp fits with any d��cor and is a great way to get the full benefits of your favorite essential and fragranced oils. You may use the oil burner in the home, while having a luxurious soak in the bath, while meditating or simply to give your room and home a breath of fresh air. Our oil burners are also great for the office, creating a lovely aroma all day long. This aromatherapy burner comes complete with a tea light candle and aromatherapy lavender oil included, but with each order you will receive a complimentary oil of your choice at no extra cost. This oil burner comes to you at the most inexpensive great price of only $7.99 and we will be expanding our line of oil burners in the future. Please place in safe area follow instructions on box and as always with lighted candles keep out of reach of children! Our favorite oil at home is orange! You decide which will be your favorite!